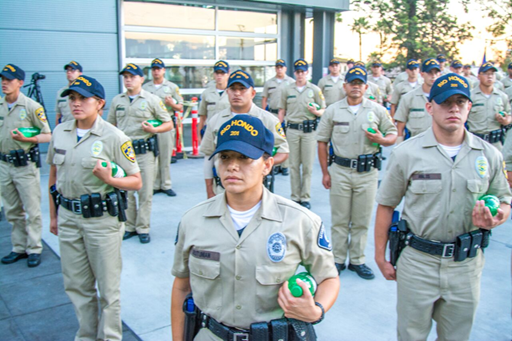 The 201st session of Rio Hondo Police Academy graduated on Sept. 10. Of the 45 cadets who graduated, four special awards were given. One cadet received the Honor Cadet award, which accounts for a cadet who excels in academics, firearms marksmanship, physical fitness training, and scenario training. Another cadet received the Top Academic award, which reflects the cadet who held the highest grade point average for the entire graduating class. Another cadet received the Top Marksmanship award, which goes to the cadet with the highest shotgun and handgun marksmanship scores in the academy. And lastly, a cadet received the Top physical fitness award, which went to the cadet with the highest physical fitness (PT) score. Out of the 45 cadets who graduated, four cadets had been sponsored by CSUN, Metropolitan State Hospital, and San Gabriel Police Departments. A total of eight cadets were hired while in the academy: one from Montobello PD, one from San Fernando Pd, one from Whittier PD, another from Baldwin Park PD, one from CSUN PD, and Three from Tehachapi PD. About six more cadets are having their background checks with Azusa PD, Stockton PD, National City PD, Santa Paula PD and CSUN PD. Also in attendance were Vice President of academic affairs, Dr. Kenn Pierson, Vice President of Student Services, Henry Gee; Vice President of Finance and Business, Myeshia Armstrong, Dean of Public Safety, Dr. Ygnacio “Nash” Flores; Associate Dean of Public Safety, Don Mason, and the Director of the Police Academy, Walt Allen. Ten Chiefs of Police and police officers from various locations such as Los Angeles, Orange, San Diego, Ventura, and Kern City police departments were also present at the ceremony. The guest speaker for the Academy Graduation was Covina Police Chief, Kim Raney. He is also the former President of the California Police Chiefs Association, and also a past president of the Los Angeles County Police Chiefs association. There were over 450 guests in attendance at the ceremony, including 150 police officers who were also in attendance.